Goals win matches. We have designed 3 great, progressive Football Shooting drills and games that encourage close range game realistic shooting and finishing to improve your teams firepower in front of goal and you can download all 3 of them for FREE as an E Book. 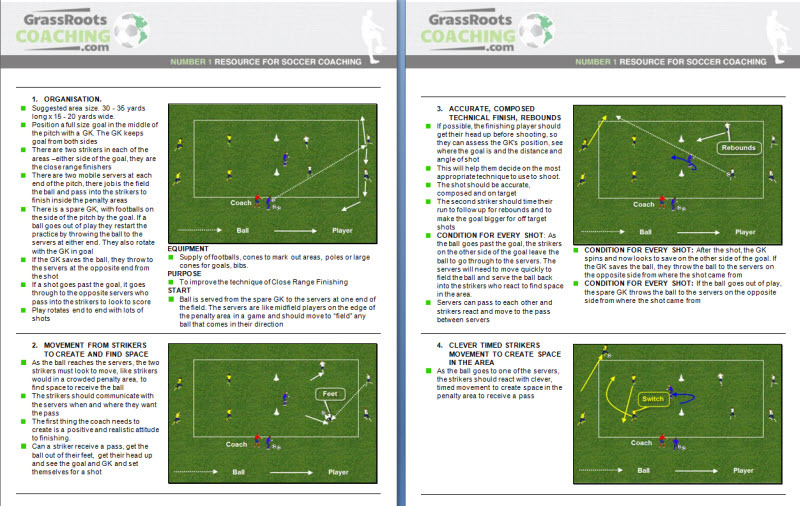 These are Football Shooting drills that are used as practical examples on a Football Association level 2 coaching course. The Football Shooting drills are dynamic, exciting, provide lots and lots of realistic close range shooting and finishing opportunities and really sharpen the finishing techniques and skills of the players. In the first one, FA Level 2 Technique of Close Range Finishing, The Football Shooting Drill is unopposed and this encourages the players to work on their close range finishing techniques and their decision making. The more opportunities the player has to practice these techniques in a game related practice, then the better the player will be at mastering these basic techniques of the game, which will improve the players confidence and the more chance they will have of improving as a player. But, players also need to be appropriately challenged in the practice. So in this practice there is a challenge competition to see which team can score the most goals in an allotted time. Players love the competitive element of the challenges. But that competitive factor of the challenge will also make players hurry their finish and make wrong choices as they strive to compete. As a result the quality of the finishing will decrease as players lose composure and rush to take a shoot as quickly as they can. This then allows the coach to help the players make decisions about using the correct finishing technique, composure in front of goal and decisions on finishing first time, setting up a team mate or controlling the ball and then shooting.